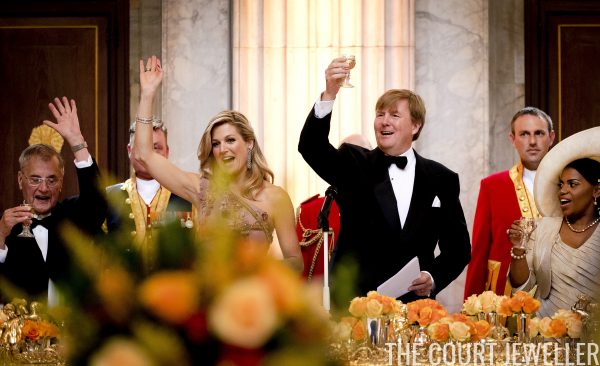 King Willem-Alexander and Queen Maxima of the Netherlands celebrated his 50th birthday on Friday evening with a special birthday party in Amsterdam. One hundred fifty Dutch citizens who are also 50 years old were invited to a dinner at the Royal Palace. Maxima wore glittering diamonds for the occasion, including a pair of dramatic earrings and both of the East Indies bracelets. Here's a better look at the earrings, which are fringed in a sort of checkerboard pattern. 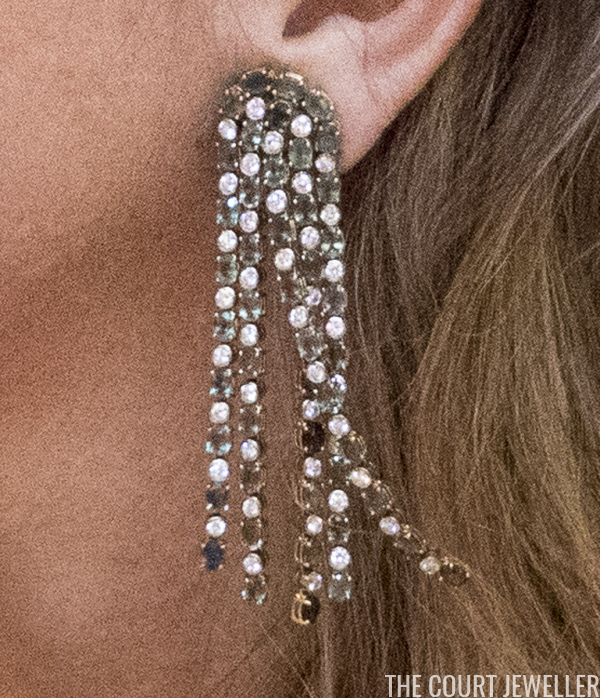 This close-up shows the curve at the top of the earrings, as well as the movement of the individual fringes. She also wore two of the family's diamond ears of wheat ornaments as slides in her hair. Here's a better look at the ears of wheat. The always-exuberant Max was unfortunately caught mid-expression here (sorry, Your Maj! ), but this photo is one of the best views I have to share of her unusual dress. The gown was made by Jan Taminiau, who has made numerous dresses for Maxima, including her stunning royal blue inauguration gown from 2013. The heavy embroidery here was inspired by wallpaper that hangs in the Palace of Huis ten Bosch. Maxima wore the dress with a vivid violet-colored wrap, which you can see in the photo above; I really like the color contrast of the shades of purple.